Round the Vines is different. The atmosphere is completely relaxed and fun, they serve wine and watermelon with the water at the aid stations, you can park, you stroll up to the start – most importantly, there is no jostling. Plus it’s a fundraiser for the local school (where 3 , soon to be 4, of my kids attend). 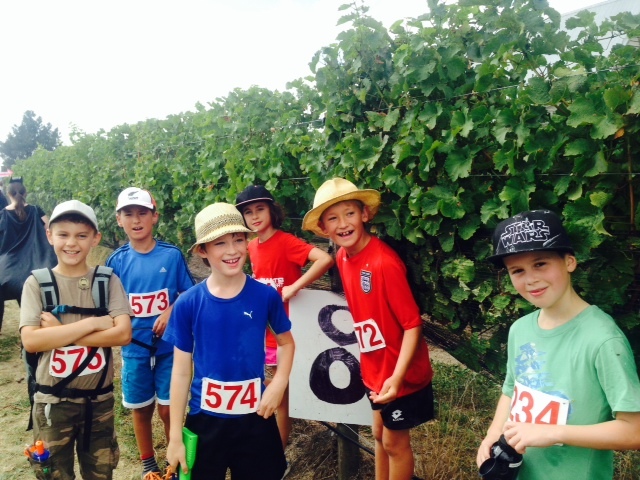 This year I took 6 kids aged 7 – 10 round the 10k course. I must admit to slight apprehension at the start, kids are an unpredictable bunch, sometimes they seem to have the most incredible stamina, and other times they start moaning if they have to walk across the Village (which is all of 200meters long). The sun was shining, and the kids were in fine spirits. It’s always a pleasure to see a gang of kids outdoors having a great time, and for me, it was nice to see them doing so in a non-competitive environment. Sometimes it’s nice to take part in something that’s just about having a go, in the walking category they knew they weren’t ‘racing’. Undistracted by adult conversation I got a little insight into the imaginative worlds they quickly created. They had a team name, created personas for themselves, cracked jokes with other competitors, and were very supportive to one another, switching out the ‘leader’ position, and waiting for stragglers to catch up. Well done kids. You guys deserve to be up on the Active Inspiration section of the blog, you rocked it. We’ll be back next year for sure. Welcome to the team Dave Bullen! Victoria University Staff Summer Promo!